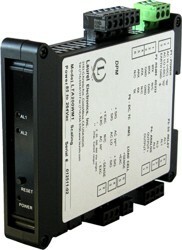 The Laureate 4-20 mA and RS232/RS485 output, AC RMS input transmitter provides six voltage input ranges and four current input ranges, all factory calibrated and jumper selectable. A special 5.000A range utilizes a built-in 0.01 ohm shunt resistor to accept the output of 5A current transformers, with no need for a stepdown transformer. The current readings can be scaled digitally as needed. High common mode rejection allows stable readings with current shunts located on the high side of the line. Digital filtering is selectable for noisy signals. Dual solid state relays, isolated, for alarm or control. Rated 120 mA at 130 Vac or 180 Vdc.